And in Florida, there’s no one better at playing the game than the still undefeated No. 15 UCF Knights (11-0, 8-0 AAC). The Knights topped rival USF (9-2, 6-2 AAC) in a thrilling War on I-4 win in 49-42 fashion, propelling them into a position to play host to No. 17 Memphis in the AAC title game next week. It is the first time in program history that UCF has gone undefeated in the regular season. Just two seasons ago, the Knights’ record was 0-12, and now it stands at 11-0, with a shot at winning the AAC and a spot in a New Year’s Six Bowl. With tonight’s win, the Knights also clinched the AAC Eastern division. 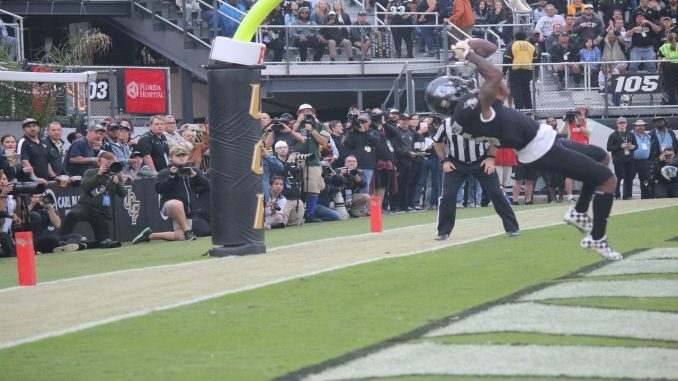 What we learned: UCF is a force to be reckoned with. It was the Knights’ 11th straight game with 30 or more points as UCF finished with 533 total yards of offense on the night. It was seventh time this season they’ve finished with more than 500 yards of offense in a single game. Anderson came up clutch for what looked to be the game-winning touchdown with 2:21 remaining in the game to put the Knights up 42-34. The Bulls however, were not phased as they responded almost immediately with an 83-yard passing play from senior quarterback Quinton Flowers, tying that game at 42 thanks to a successful 2-point conversion. But just when it looked like the game was heading to overtime, junior cornerback Mike Hughes had a different idea. Hughes received the kickoff, cut, and never looked back. The junior took it back 95 yards for the touchdown to give the Knights a 49-42 lead with 1:28 left in the game. USF had a chance to tie the game once again, but fumbled on its final drive. It was Griffin who recovered the loose ball. What went right: A win does not have to be pretty and that was the case in a lot of moments tonight, but UCF’s will to win was what never seemed to fade. Milton had a decent night as well, rushing for 56 yards and a touchdown, while throwing for 373 yards and four touchdowns. It also certainly helped that Spectrum Stadium was full. The crowd was a consistent force for the Knights all night with 47,129 in attendance. Each quarterback for both teams had only one interception throughout the night, with senior quarterback Quinton Flowers taking sacks three times compared to Milton’s zero. What went wrong: The Knights’ defense struggled to contain USF’s offense all game as Flowers rushed for 102 yards and a touchdown, while throwing for 503 yards and had four touchdowns. Offensive player of the game: He has led the offense all year, and he did it again tonight. Milton only had one major error on the night, throwing one interception. His response however, was a 45-yard touchdown pass to sophomore receiver Dredrick Snelson to help the Knights regain their lead. Defensive player of the game: With an interception to keep USF from taking the lead at the half, and the game winning 95-yard touchdown run, without a doubt, Mike Hughes was the MVP of this game. He saved the game, not once, but twice, and without the big plays that he made, the result could have been far different for UCF. The Knights take on Memphis next Saturday in the AAC Championship game at Spectrum Stadium.